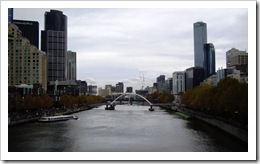 I thought that it was about time that I started putting up some photos of Melbourne – seeing as I live there. It’s amazing that it’s so easy to wander around a strange city taking photos, and yet it seems strange to do the same thing at home! Even though I would be lucky to go into the City once or twice a year. 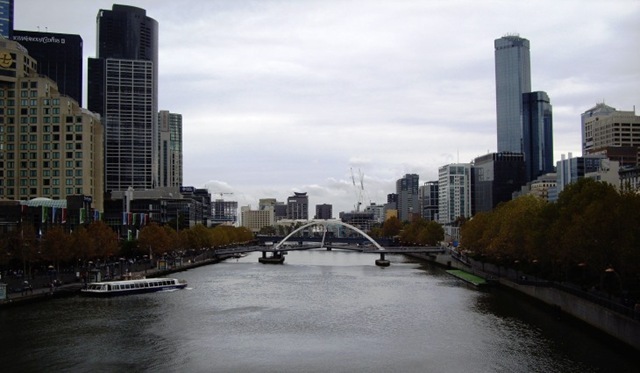 So here we have a view looking down the Yarra River towards Crown Casino and the Melbourne’s World Trade Centre. Southbank is on the left and Flinders Street Station obscured behind the trees on the right. In the centre is the pedestrian footbridge linking Flinders Street and the Southbank precinct.